Florida State downed Vanderbilt 7-6 in Sunday’s deciding game three of the Tallahassee Super Regional. 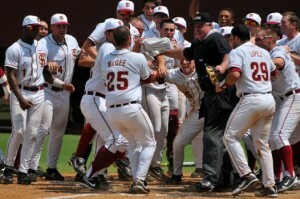 The win makes FSU the third teams to advance to Omaha in 2010 along with Florida and South Carolina. See the links below for more details. The trip to the CWS is the 20th all-time for the Seminoles, but just their second since 2000. By clicking the “Tallahassee Super Regional” link above this page will expand to fully support the table below. CLICK HERE for our Super Regional Central page where you find links to the other Super Regionals. Florida State: The Seminoles were the only #1 seed to go on the road for Regional play this year. They were 3-0 at the Norwich, CT Regional, and get to host the Super Regional after Vanderbilt upset #7 national seed Louisville last week. Mike Martin’s FSU teams have made it to at least a Super Regional in 10 of the 12 years the format has been in place. Mike McGee does a little bit of everything for the Seminoles. The junior leads the team with 14 HR, 67 RBIs, 11 saves, and a 0.38 ERA to go with a 4-0 record on the mound. Starter Sean Gilmartin (8-7, 4.74 ERA) is a two-way player as well. He’s hitting .409 with 11 RBIs in limited plate appearances. Tyler Holt is the team’s top overall hitter with a team leading .349 avg. as well as 12 HR, 42 RBIs, 24 doubles, 29 stolen bases, and a 1.069 OPS. Vanderbilt: This season marks the fifth straight NCAA appearance for Tim Corbin’s Commodores, and it’s his second trip to the Super Regionals. Vanderbilt players buzzed their heads prior to last week’s Regional win at Louisville, and now Corbin has a debt to pay. He promised his team he would buzz his head as well if they won the Regional, and he says he will keep his promise. Freshman Anthony Gomez (.377) has been one of the top hitters in the SEC all year. Jason Esposito (.359/10 HR/59 RBIs/30 SB) and Aaron Westlake (.308/14 HR/58 RBIs) are the team’s top run producers. The Commodores have players with some pedigree. Sophomore Jack Armstrong (7-3, 4.32 ERA) is the son of the former big league pitcher with the same name and freshman Mike Yastrzemski (.233/2 HR/16 RBIs) is the grandson of Hall of Famer Carl Yastrzemski. Staff ace Sonny Gray (9-5, 3.51) pitched for USA baseball last year and is invited again this year. He is perhaps the best pitcher in the nation with five losses. Russell Brewer (2-2, 3.07 ERA, 6 SVs) heads a relief corps that has seen six hurlers total 13 saves. Richie Goodenow (podcast above) was the story of last week’s Regional. The junior made just his second career start in what was his 68th career appearance in Sunday’s elimination game vs. Louisville an tossed a two-hit shutout to force Monday’s deciding game.